The next game in the works from AGR Games is called Neighborhood of Love and Hate. There are a handful of stats you choose at the beginning of the game that may or may not allow certain paths through the game. There is a basic inventory plus cash. 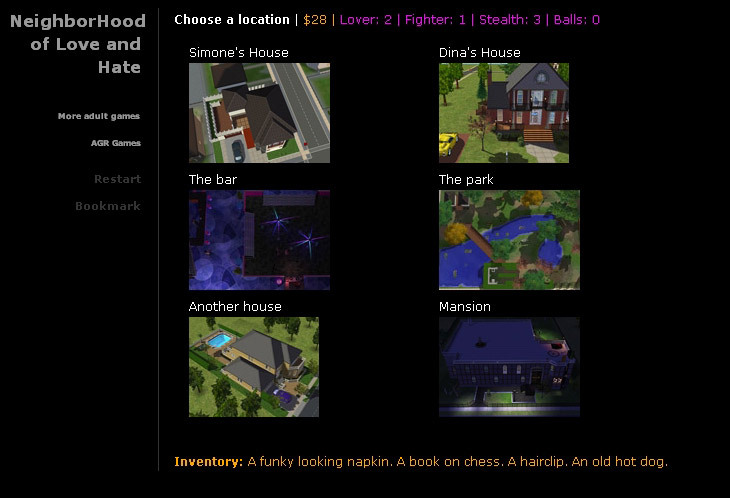 The game is open ended and the five locations can be explored in any order (the mansion will be available as a separate game later on. ), and some situations can be solved in multiple ways. There are eight girls to hook up with, including several characters from previous games and movies. I still have one more house to finish up, and technical fixes, beta testing, and preparation for release. Which will be when it’s finished. If u ever need someone for testing ur games… here i would do it. Excellent!! I can’t wait until this is finished It looks really good judging from the pics…and glad to see Simone is back in your game. Does that mean her room mate Stephanie will be making an appearance? 😉 I love your games, you do a really great job. Definitely looking forward to this game!!! Is there an estimated time his game will be available? Simone, Stephanie from a Date with Simone, plus Larissa and Dina from A Date with Larissa. And then several new females as well. Xia will return with characters from the Xia’s Housewife video series in the Mansion Expansion later on down the road. This release is getting close. 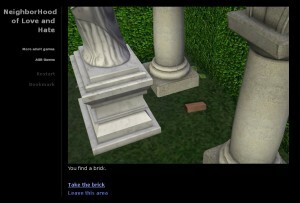 I finished the game proper, just doing some testing, and finishing touches, need to get beta testing going next. That’s great news on all fronts! I’m very excited and absolutely looking forward to the release. Thanks for the quick reply and thanks for all the hard work you do!! The beta test has started. Leave a comment with your NewGrounds account name if you’re interested. And mention if you’ve done any betas before, or something you think would be helpful to the task. My NewGrounds name is Ceesko. I have done a few betas before for smallish flash/indie games. I’ve sent out invites on NewGrounds for BetaTesters, please check to see that you’ve received it. PM on there when you have any results you’d like to share. Would love to test out the beta my newgrounds name is bcn70. I havent done any reviews on newgrounds however i have testest Eve Online during beta as well as Star Wars the Old republic. Currently reviewing and testing World of Battleships. Beta is closed. I have gotten some very useful feedback and bugs found from some of you, thanks! If you have been invited on NG to test, please message me at least once with any info or questions you may have.